The Daily Mail supported Hitler as well as Oswald Mosley and his British Union of Facists. And as recently as this month, the Mail wrote an article supporting a rising far-right fascist group in Germany whose leader likes to dress up as Hitler. 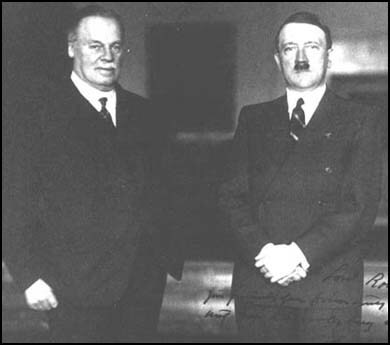 Are we really to believe that the present Lord Rothermere – like his relatives – didn’t realise how anti-semitic the party is? Never mind anyone else apologising. Isn’t it time the Daily Mail apologised to the British people for its long-standing support of Hitler, Fascism and anti-Semitism? No, it is a pointless exercise the current mail staff were not working at the Fail at the time. Hitler had apparently pulled Germany out of the trough it as in following the Great War, and turned into what was considered by most countries in the world to be an outstanding success, and a positive way to progress, the manner in which the sick, disabled, and needy were treated was ignored, a bit like todays coalition, because hard work and success were lauded as the only usefull parts of citizenship, and the germans practised for the later attack on the Jews, nations were all to happy to ignore this, and if the fail should be expected to apologise so should every nation that possibly had more information of the truth than the fail for doing nothing and letting Hitler embed his ideas. The Wail is just using the distant past (40 yrs ago), with which Harman had no direct contact (i.e. with the defunct PIE) to insert its grubby little knife between her ribs, and less directly into the NCCL/Liberty. As the posting says, it should deal with its own Augean stable first. Lately, it just dusted off 80 yr old spiteful and bigoted headlines to spit at non-existent floods of Bulgarian and Romanian immigrants. It did just the same with asylum seekers (bogus, of course, without exception, regardless of obvious injuries). And claimants (as with the Depress) make useful targets in the meantime. Thanks to IDS I am left with no support other than my hard earned savings, so why should I have a different view of the fascist ideations of this abysmal little man. No shame a hallmark of uber-conservatives? 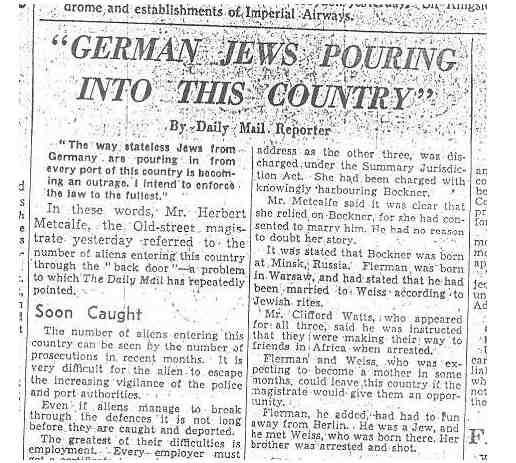 For as long as the paper has been in print it will have been attacking people in the 30’s it was Jews escaping persecution not it’s the sick, disabled, and the unemployed. Why is there no Facebook share button? There’s one showing on mine. Try reloading the page. The Daily Mail still has a really nasty underhand almost sneering anti-Jewish subtext running through it. Whether you’re a Labour supporter or not, you can see it in the way it treats Ed Miliband and somewhat bizarrely often uses the word ‘flamboyant’ (often as a euphemism for shady) to describe Jewish entrepreneurs much more disproportionately than it does when the subject is non-Jewish. It also seems to share a lot of the NSDAP stance on gender issues with a clear Kinder, Kuche, Kirche mentality when it comes to women (whom it really wants out of the workplace and back in the home). As well as being deeply gender normative, it is also heterosexist and one gets the impression that some of the Mail journalists and many more of its readers would prefer to see the re-imposition of homophobic laws like Clause 28 and even – if the tone of the commenters on its online threads are taken into account – a return to the pre-1967 Britain where being gay was completely illegal. Needless to say, with such a misogynistic and homophobic outlook, it’s no great surprise to find that on its league division one list of regular targets, one of the groups happen to include people just like me: transsexual women. Maybe I should cut my losses and make up something scandalous about my otherwise mind-numbingly boring life now just so I can at least get something out of it and make a fast buck;)!